Smear some cream cheese on a celery stick and you’ve got a quick, low-carb snack; make this delightfully retro stuffed celery and you’ve got an impressive hors d’oeuvre. Pureé goat cheese, cream cheese, yogurt, Worcestershire, and hot sauce in the bowl of a food processor and puree until smooth or mix by hand. Season with salt and pepper to taste. Divide cheese mixture in half. Stir tapenade or chopped olives into one half and roasted red peppers into other half. Set aside. Filling can be made ahead and softened to room temperature before using. Peel celery with a vegetable parer to remove all the strings. Cut into 3- or 6-inch lengths. With a small spatula, fill each celery stalk with 1 to 2 tablespoons cheese mixture or pipe filling using a pastry tube with the star tip. Use olive filling for half the stalks and red pepper filling for the rest. Sprinkle half the appetizers with paprika and garnish half with snipped fresh parsley. Serve chilled. Use the same filling for tiny, fresh or pickled peppers or cherry tomatoes, split snow peas, or marinated artichoke bottoms to make a colorful party platter that will look like it was a lot more work than it was. NOTE: Eliminate the goat cheese and use 8 ounces of cream cheese for a less expensive version. Makes 18 servings of 1 six-inch-long or 2 three-inch long pieces each. 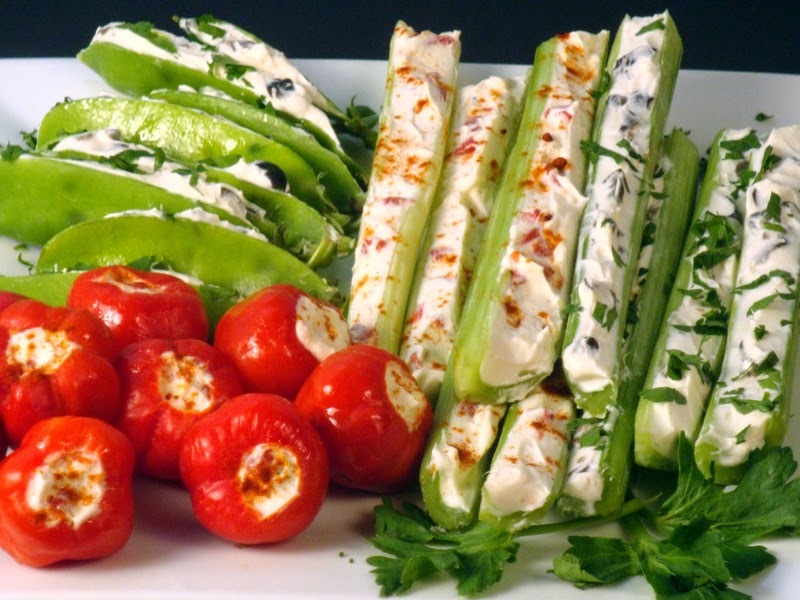 Celery, Goat Cheese or Cream Cheese, Healthy Appetizer. Bookmark. What would you suggest as an alternative for the Worchestershire sauce for vegetarians?